A sk any group of ex-pats or visitors in San Miguel de Allende what they love about Mexico and you’ll get a wide variety of answers. But one seems to crop up again and again, usually accompanied by a dreamy smile: THE FOOD! Mexican food can be the ambrosia of the gods. And San Miguel de Allende has way more than its share of fine restaurants where it is definitely done right. You could eat a fine meal several times a day for an entire stay and not run out of great places to try. Despite the long list of excellent places to eat in San Miguel, sometimes you just don’t feel like yet another restaurant meal. You want to savor the delights of browsing in the markets, of looking for the freshest produce, the ripest fruits, the good cheese and spices and the moles, and put them together perfectly to create your own Mexican feast. 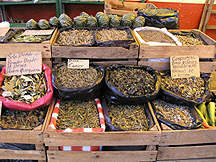 Taking one of the cooking classes in San Miguel can give you the tools to do it. 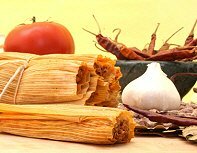 Mexican cooking is full of subtle techniques, savory ingredients you never expected, and combinations of flavors that make your eyes pop... and your taste buds smile. And since almost all these Mexican cooking classes end with feasting on the dishes just prepared, you’ll go home filled with more than enthusiasm for this delicious cuisine. There are several San Miguel cooking schools and teachers to choose from. Some base their cooking classes on family recipes passed down through many generations. Other cooking teachers came to Mexico, fell in love with the people and the food, and never went home. Still others feature local chefs with fine reputations for quality and innovation. There really is no better way to dive into a country’s culture—and even its history—than to make a study of its food and styles of cooking—and to help prepare them with your own hands. Learning Mexican cooking at one of the cooking classes in San Miguel de Allende will reward you in many ways. Kris Rudolph is the owner of El Buen Café, at the corner of Jesús and Cuadrante, and the author of Mexican Light: Healthy Cuisine for Today’s Cook, among other books for foodies. She has been giving Mexican cooking classes at her café and elsewhere for many years, but now she has opened La Cocina Cooking School in Colonia San Antonio. Kris generally teaches classes twice a week and also brings in guest chefs to give classes in various aspects of Mexican cooking, such as Oaxacan Cuisine and The Glory of Agave. La Cocina is one of the most popular cooking schools in San Miguel de Allende. Click here for Kris' Tres Leches Cake Recipe. Drawing on several generations of excellent family cooks, María Ricaud emphasizes the cuisines of Oaxaca and Michoacán in her classes. She gives cooking classes in San Miguel custom designed from a long list of specialties, including moles, salsas, tamales, and cochinita pibil. Patsy Dubois, who is a popular caterer in San Miguel as well as a fine cooking teacher, has a hacienda-style kitchen in the country where she gives a 4-hour introductory class in the basics of Mexican cooking—chiles, nopales and guacamole, among other dishes. Her specialty is cooking traditional Mexican dishes using fresh vegetables from her own garden and greenhouse. This Mexican cooking school is housed at the back of the Sazon kitchen boutique at Correo #22. It's owned by Orient Express Hotels, which also owns the Casa de Sierra Nevada Hotel. This nifty connection means a steady stream of great guest chefs from various Orient Express hotels coming to teach cooking classes in San Miguel. The Sierra Nevada's own chef, Gonzalo Martinez, is one of the regulars. Classes are generally offered four days a week, Tuesdays through Fridays, from 11 am to 1 pm. These are demonstrations classes, not hands-on, and include tastings and a packet of recipes. A Jarocha refers to someone from the gulf coast state of Veracruz, and that’s where Reyna Polanca Abrahams comes from. She specializes in teaching Veracruzano dishes in her kitchen in Colonia Guadalupe. 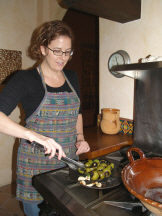 She has been offering her cooking classes in San Miguel for years. She especially enjoys demonstrating such classics as pozole, sopa de tortilla, mole verde, and a surprising delicious avocado cake. One of the nicest bed-and-breakfasts in town is Casa Luna, with two locations. They are offering cooking classes with professional chef Alejandro Gomez-Tagle. Both thoroughly professional and entertaining, he demonstrates classic Mexican dishes and some newer takes on them as well. Classes are organized by request, with a minimum of 6 students and a maximum of 10.